MediaGoblin has several things going for it, not least of which is that, in this post-PRISM world, you can set up and control you own personal media-sharing site without having to go through Google or Vimeo. 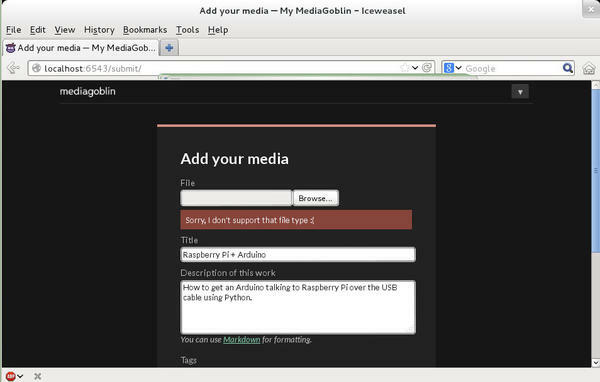 MediaGoblin is also very versatile, because it can also act as a stand-in for Flickr, SoundCloud, and, soon, Blogger. Additionally, it can render 3D files in real time. and answer no to the three questions PostgreSQL asks you about the user’s privileges. I will assume that all the following step are executed from within the /var/www/mediagoblin directory. to an address that you want warnings to be sent from. You’ll also need to edit mediagoblin/config_spec.ini, specifically the lines shown in Listing 1, to configure the setup for your email server. 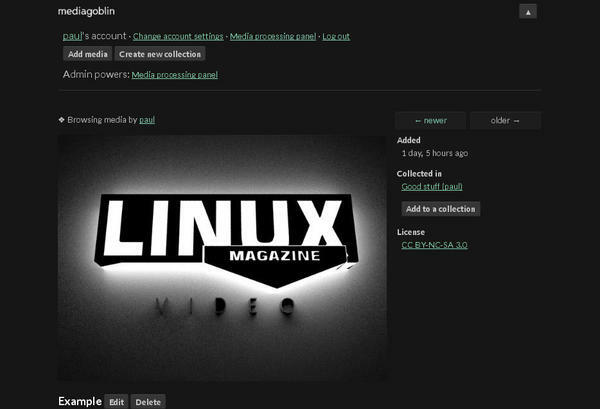 By the way, gmg is a MediaGoblin tool that comes with several utilities for updating databases and managing users; it even provides a Python shell to monitor and change MediaGoblin’s behavior on the fly. In this case, I’ll update the databases in MediaGoblin. and visiting http://localhost:6543 (Figure 1). By using the --server-name=broadcast option, you should also be able to access the server on your intranet at http://<serverip>:6453. Although MediaGoblin comes with its own server embedded for testing purposes, this server is not adequate for production. To help serve all the static material, you should deploy MediaGoblin with a full-fledged web server, such as Apache or Nginx. so that the system sends emails to users (e.g., verification emails). If you don’t, the text of the email will show up on the lazyserver output, but won’t be sent over the Internet. As mentioned previously, you will also have to write in the correct configuration for your email service in mediagoblin/config_spec.ini. Currently, the site admin’s powers are limited to being able to monitor contents being processed. Finally, there’s the matter of getting types of media working on your server. 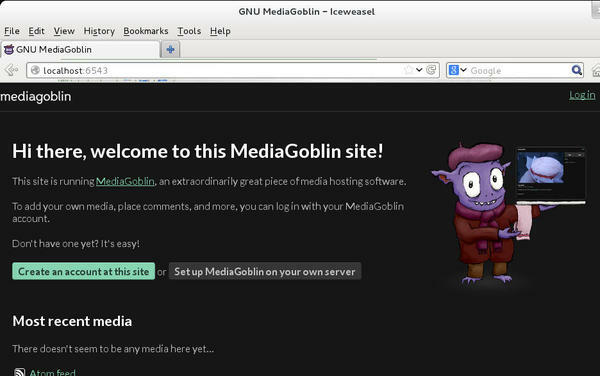 By default, your MediaGoblin site will allow you to upload images. Try anything else, and you’ll get a “Sorry, I don’t support that file type :(” message (Figure 2). and start uploading audio files to MediaGoblin. The system even renders a graphic wave representation of your files (Figure 3). 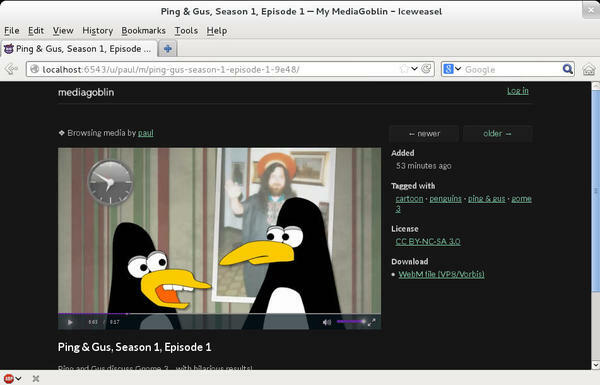 MediaGoblin transforms all videos to the WebM format, the open video format developed by Google, and, in theory, supports a wide variety of upload formats. I tried MP4 and WebM, which worked fine, and also OGV (Ogg Theora), which didn’t. There’s a bug in the thumbnail-creating code of the version I was using (nightly 0.6.0). I hope by the time you read this, that bug will have been squashed. One thing that makes MediaGoblin unique is that you can share 3D models on your site (Figure 5). The format used is STL, an industry standard that you can easily produce with Blender 3D. 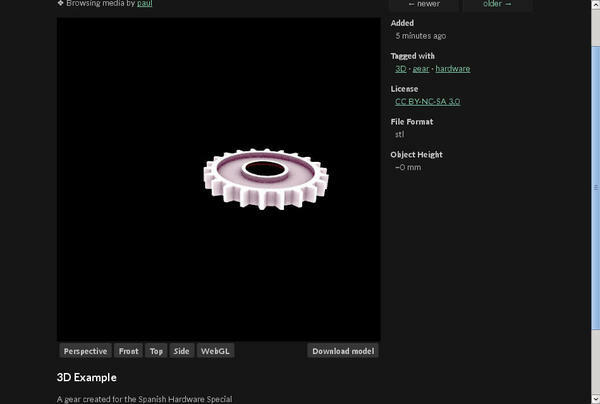 Figure 5: You can also show and share 3D files produced with Blender. 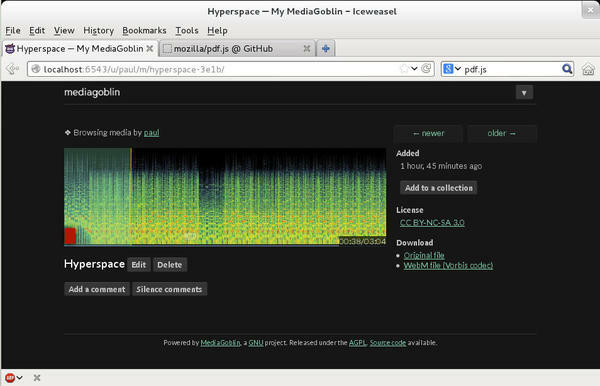 in the [plugins] section of mediagoblin_local.ini. Then, do the usual gmg updatedb and ./lazyserver.sh --server-name=broadcast. Be warned that support for 3D in MediaGoblin is still spotty and complex meshes with complicated nodes will probably crash the plugin. My advice is to strip down your models to the bare essentials. Once you have loaded a mesh, you can see a shaded version in perspective, from the front, top, or side, or you can pan, zoom, and move around it using the WebGL view and your mouse. in your mediagoblin_local.ini. Then, download pdf.js. Unzip the package in your mediagoblin/static/extlib/pdf.js directory, run gmg updatedb, restart your server, and you’re good to go. In theory, this step should also allow you to upload ODF files to your platform, including text, spreadsheets, and more. The plugin should then transform the uploaded files to PDFs for sharing. Unfortunately, on my version, a bug crashed the process. MediaGoblin is being actively developed, so maybe by the time you read this, that bug also will have been squashed. 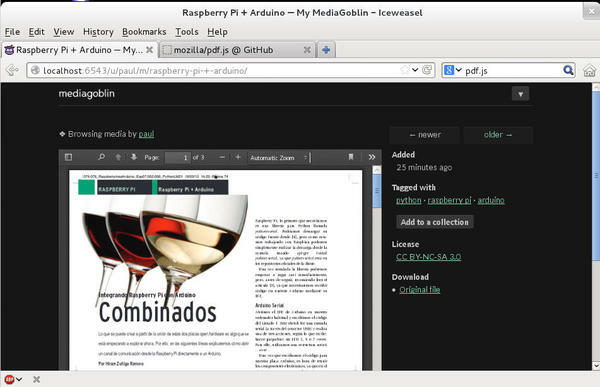 Figure 6: MediaGoblin has a feature-rich reader and renders PDFs beautifully. Once you’ve set up your site and created some users, it’s time to upload some content. When you log in, your content is shown below the MediaGoblin menu bar. The bar is tucked away, but you can access it by clicking on the downward-pointing arrow on the right (Figure 7). Figure 7: You access the user’s menu by clicking on the downward-pointing arrow on the right. From here, you can change the setting in your account, visit the content-processing panel (if you are an admin user), log out, add content, or create a new collection. It doesn’t get simpler than that. You also can group media into Collections, tag them, and comment on them; you can change the look and feel of your site using themes. Despite its bugs, MediaGoblin is great. Once you’ve gone through the admittedly complex installation and post-install configuration, you can see where MediaGoblin is headed and its enormous potential. Thanks to its modular architecture, new media formats are constantly being added and improved, and development of the platform is going ahead at full steam. Currently, there’s no easy way to embed your media into pages of non-MediaGoblin sites – la YouTube or Vimeo, nor is there any Share; these things, however, will no doubt be included in upcoming versions. Additionally, the developers have lofty plans for the future. They plan to develop MediaGoblin as a “federated” network of media-serving sites, allowing a user to subscribe to multiple channels on one site, for example, regardless of whether the channels are hosted on the same site or another one in the same network. They are also implementing a blog plugin, which will make MediaGoblin an all-in-one solution for your media-flaunting needs.